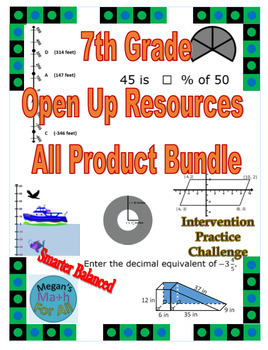 Are you using Open Up Resources from Illustrative Math? Here are all 24 of the 7th grade products for units 1 to 8. There are 8 unit summative practice products, 8 sets of task cards, and 8 sets of vocabulary cards that align the content of Open Up Resources to end of the year summative tests. These are aligned to SBAC and use the Smarter Balanced Item Specs. Based on the released items this works very well in preparations for the PARCC test as well or other state assessments. You will get great data and information about which of your kids need a little more help in learning about the all of the 7th grade Common Core standards. I have created the images, graphs, and equations saving you lots of time. These are also formatted for easy scoring. Print and go! The answer keys are included. Every file currently comes in two formats: Editable Word and PDF. Note: These files will all be available in an editable Google Doc format in the coming months. If you buy this product, I will post updates and you can re-download to get the Google docs at a later date for no additional cost. Each Word document is editable and you are free to edit and make necessary changes to teach your precious children. Feel free to make the test longer or shorter. You could also make multiple versions for yourself if you wish. With this bundle you will save $10.50 over purchasing each item separately.